Some have commented that Stephen Heppell's flyaway pole article is a bit short on dimensions, so this article aims to provide some and detail some of the other options which have become popular since the system was introduced. 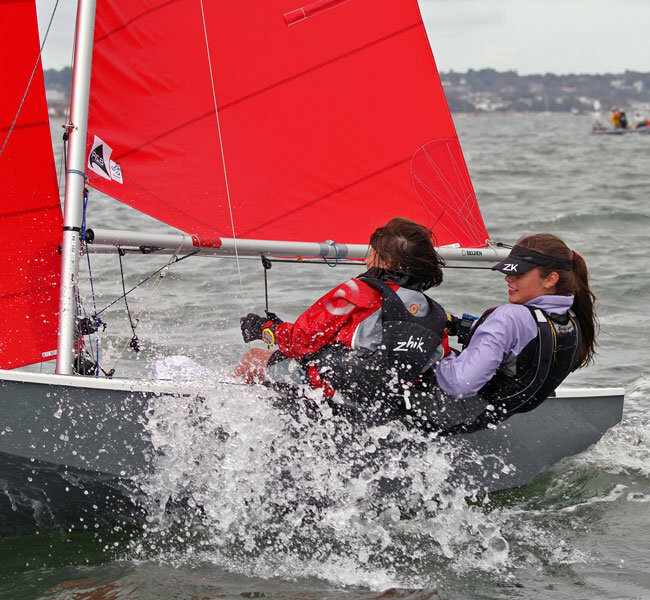 It's normal for Mirror dinghies to have the spinnaker chute on the port side, so it is to leeward when hoisting the spinnaker on starboard tack as naturally happens with a Triangle - Sausage or Trapezoidal outer loop course. With the chute on the port side, It makes sense to have the flyaway set up with the spinnaker pole on the starboard side of the mast, so it is to windwind when hoisting. All the boats shown have this arrangement. The part of the downhaul attached to the pole need to be rope with a positive stop (for example a knot) to prevent the pole lifting too high when set. 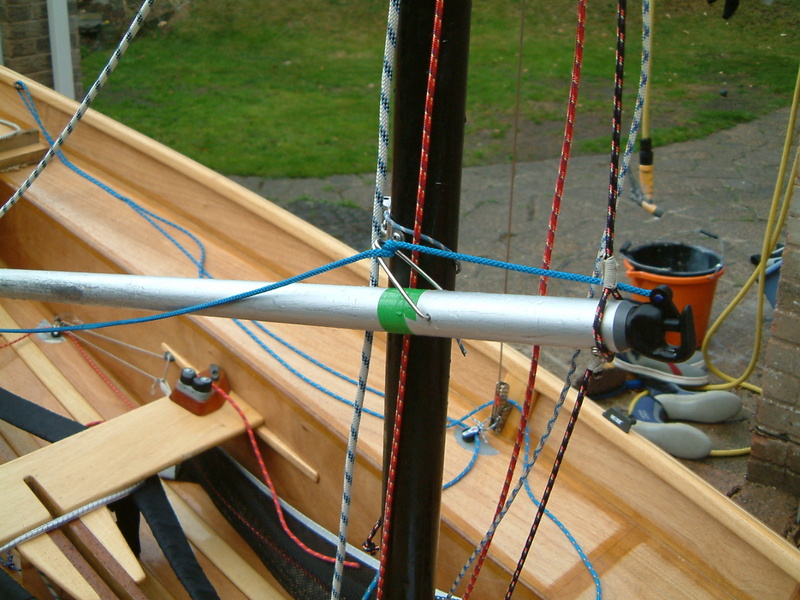 After that the downhaul should be elastic so that the downhaul remains under tension and the outer end of the pole stays near the mast when it is stowed. 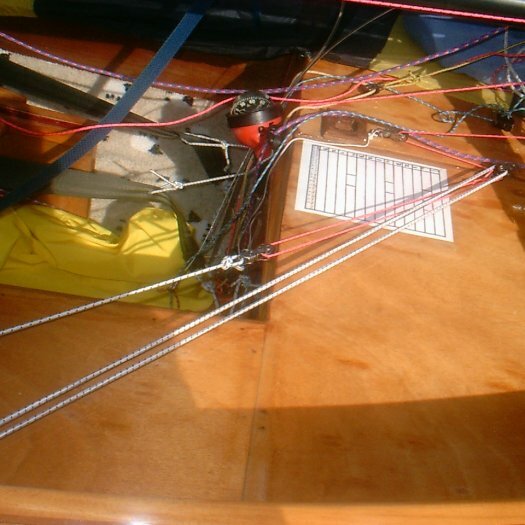 Because the downhaul and the uphaul are attached to the outer end of the pole, the length of downhaul which need to be retracted by the elastic is considerable - more than the length of the foredeck. If you have a Bermuda mast there is enough length within the spar for the whole downhaul system to be rigged within the mast and most manufacturers do this. 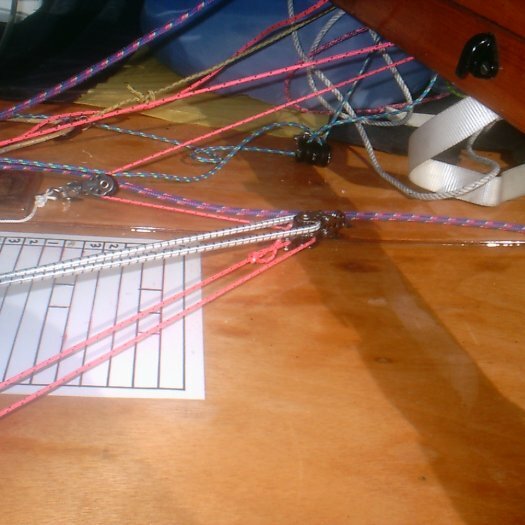 If you have a Gunter rig, or are retro fitting a system to a Bermuda mast it's not possible to simply have the elastic attached adjacent to the knot, and then go around a block attached to the forestay fitting. It's also necessary to have a long length of elastic, otherwise it will be hard, or even impossible for the pole to be pulled out. 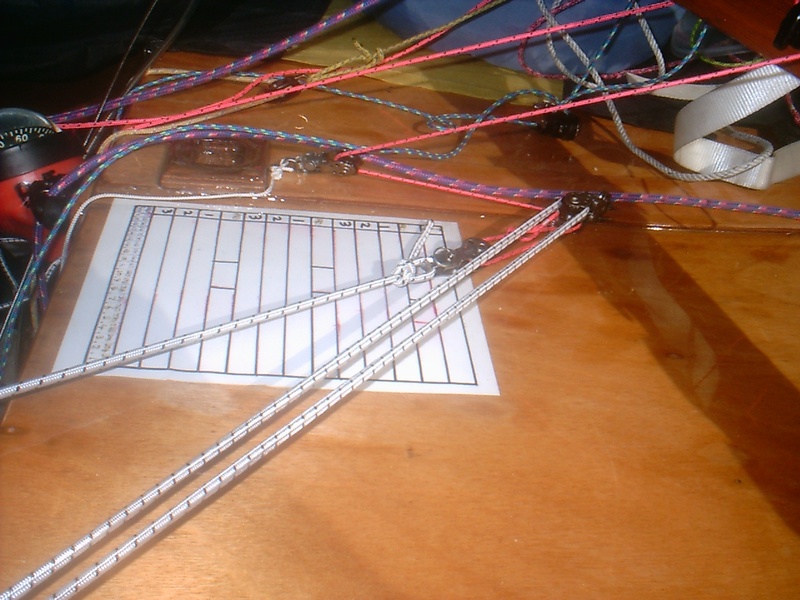 The solution is to have a system with the elastic attached to the downhaul via a free block as in the photo above. 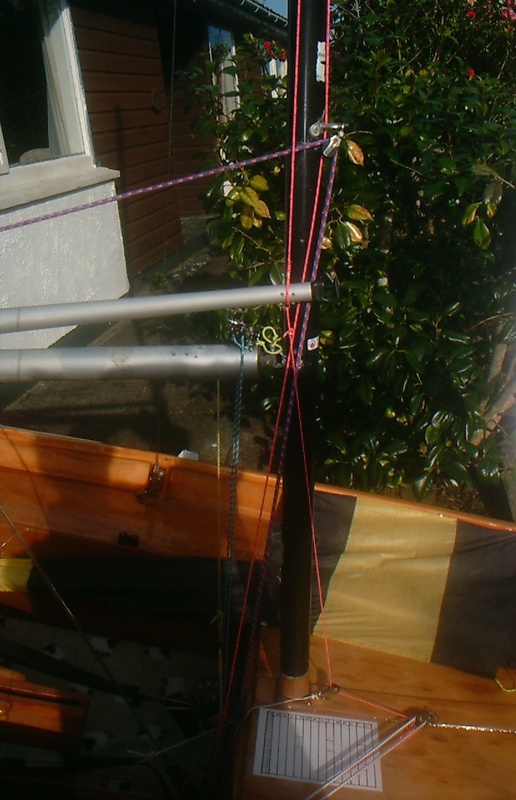 As the pole is deployed, the downhaul (black with pink, mauve and yellow markers) runs around the block attached to the mast step. 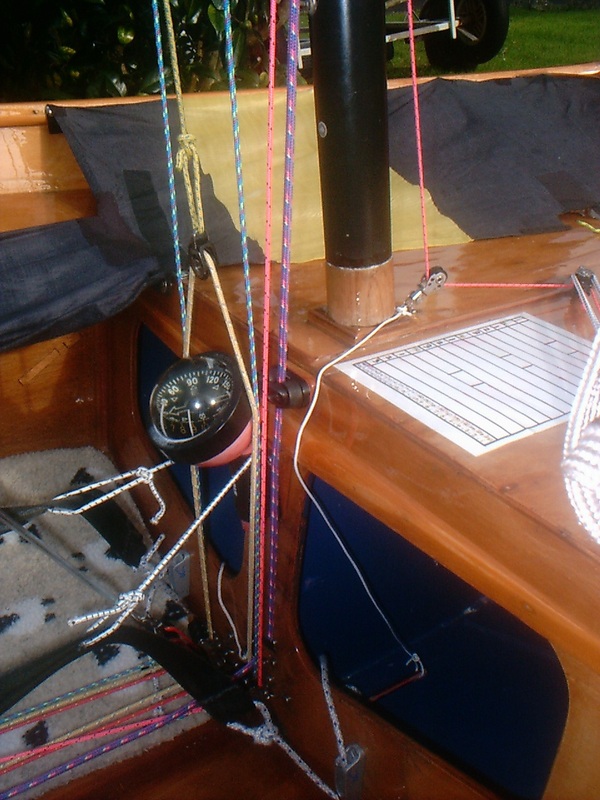 The free block moves aft across the foredeck until it is near the mast step, and the elastic (plain black and running around a block on the forestay attachement fitting and then back to end on the mast step) stretches. Attaching the block for the downhaul to the mast step, or the foredeck, rather than the mast, makes it much easier to take the mast down for transportation. If you don't want the downhaul running up to the forestay attachement fitting, you can run it back to the shroud block as in the system shown above. 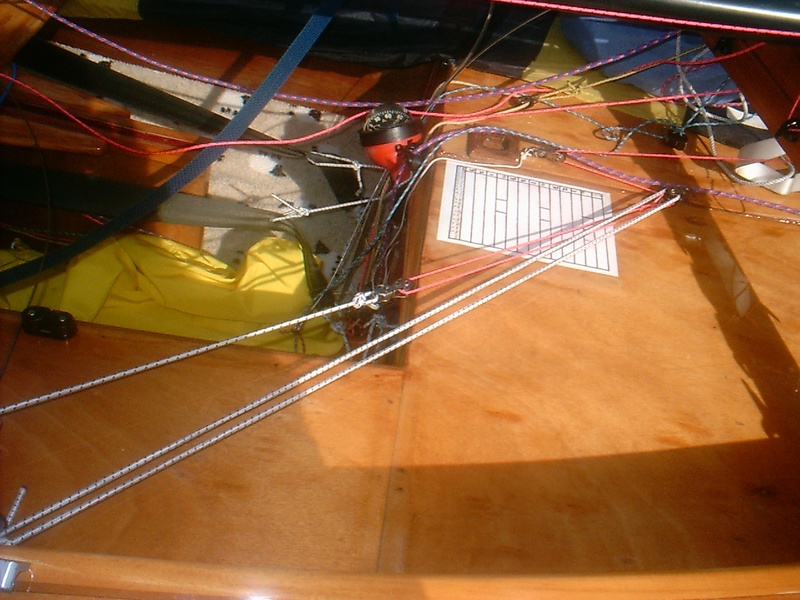 In this case the downhaul (2.4 metres of 2mm dyneema/spectra - 2mm runs much better than 3mm in this system and is strong enough) goes around a small swivel block (Harken HK417) fixed to the foredeck. It then goes around the top sheve of a double block with a becket (Harken HK407) which is fixed to the foredeck about 230mm ahead of the aft mast step (about where the forward mast step goes if you have one). The Harken HK407 is not the easiest to attach in this position, I used a long deckclip and bent it a bit to get the required height. 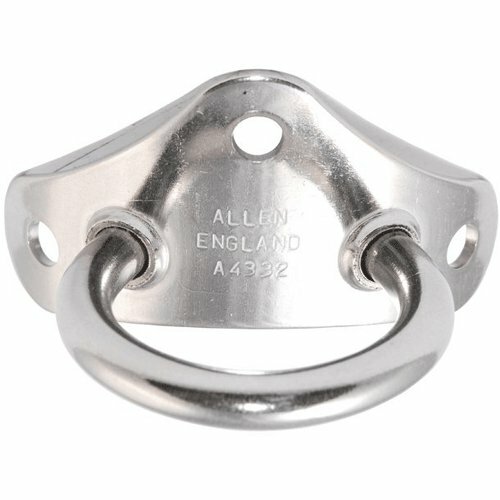 An alternative would be an Allen A4081 which can be screwed down directly and then a small deckclip (such as a RWO R2820) in place of the becket. 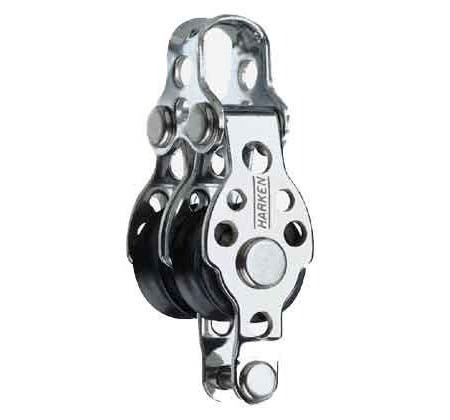 The downhaul then goes around the sheave of the free block (another Harken HK417) and then back and attaches to the becket of the block. The elastic is 5mm diameter and you need about 3 metres it is attached to the top of the free block, then around a small block (RWO R1530) attached to the shroud block with a small deck clip (in this case a RWO R2820 and you need to bend it to fit). It then goes around the remaining sheave on the double block with becket and finishes on the small deck clip on the shroud block. 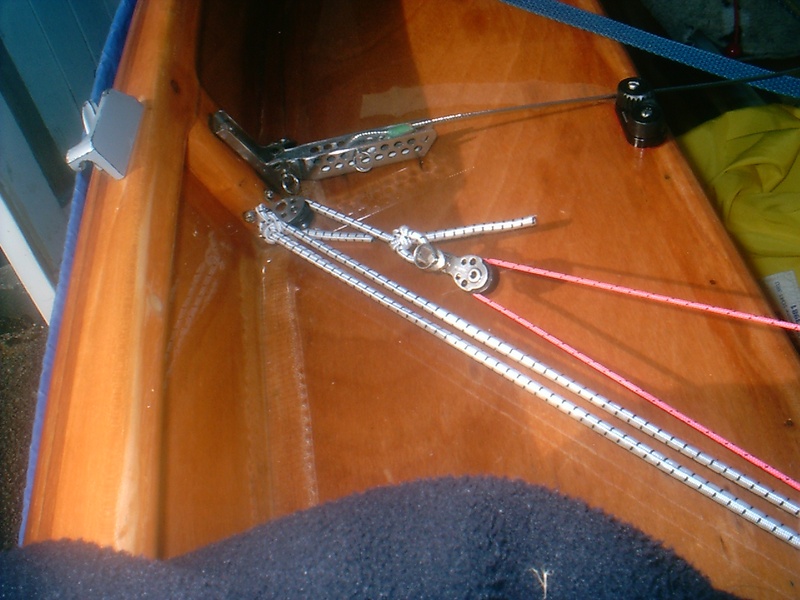 The downhaul and the uphaul are attached to the outboard end of the pole and a deckclip used to hold them in place as shown in photo. 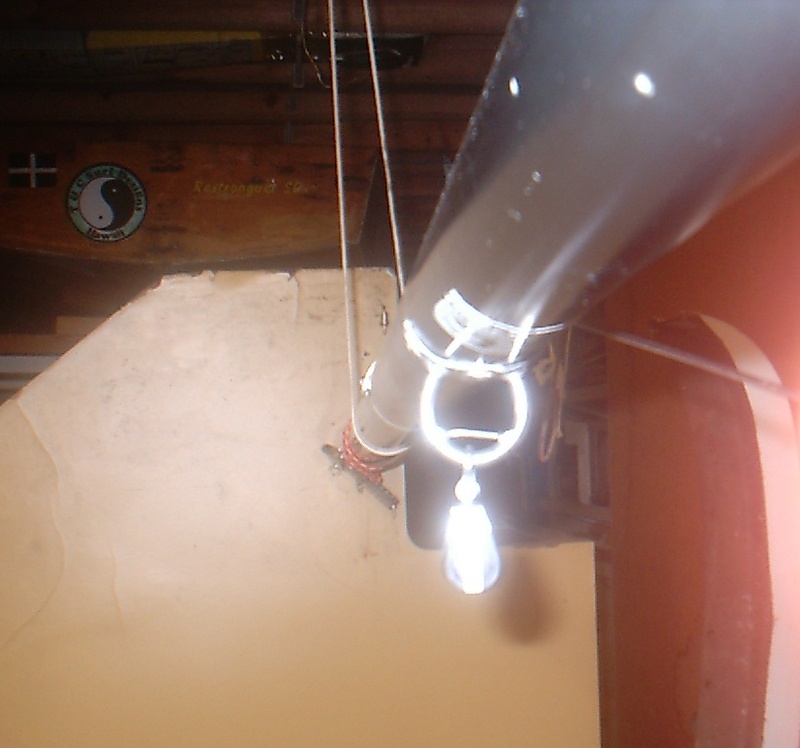 Note the uphaul (which is under considerable tension) is looped around the pole and pole end has the hook facing up. 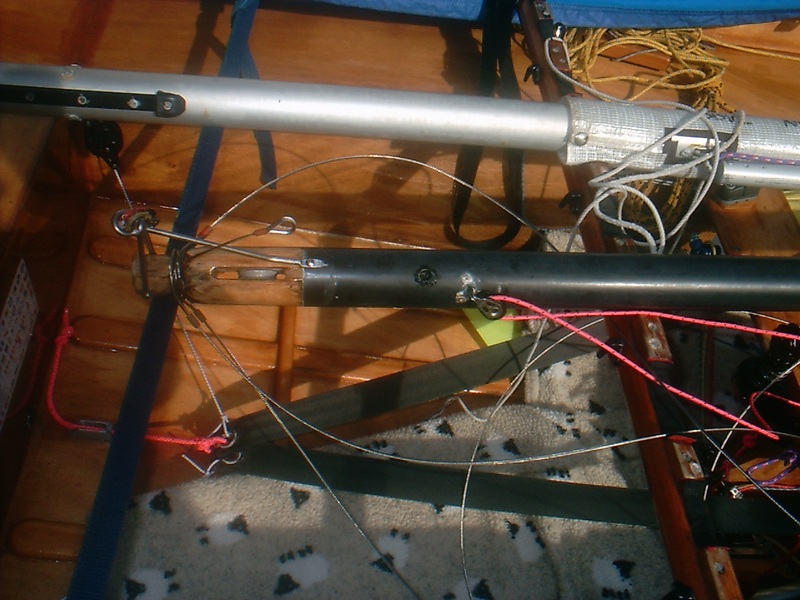 On the outboard end, which takes the spinnaker guy, you can have a conventional pole end hook fitting with spring loaded pin (see photo above). With this fitting the pin (which the blue line is attached to) has to be pushed against the spring, to open the fitting to allow the guy to be put in or taken out. The alternative is a "fork" fitting like this which is less positive, but some prefer. The forks may need a bit of bending to get the correct gap - a compromise between the fork gap being small, which is good for holding the guy in the pole end, and large, which is good for inserting and removing the guy from the end. 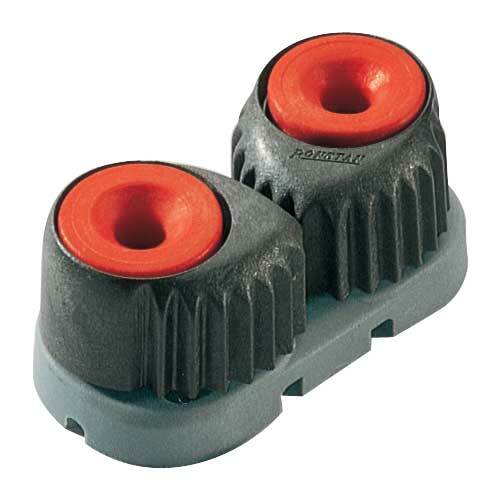 On the inboard end you need a plastic end plug. A whisker pole end with the spike cut off is one option. From the outboard end of the pole the uphaul (in this case 3mm dyneema/spectra) goes around a small block mounted 280mm below the top of the mast. 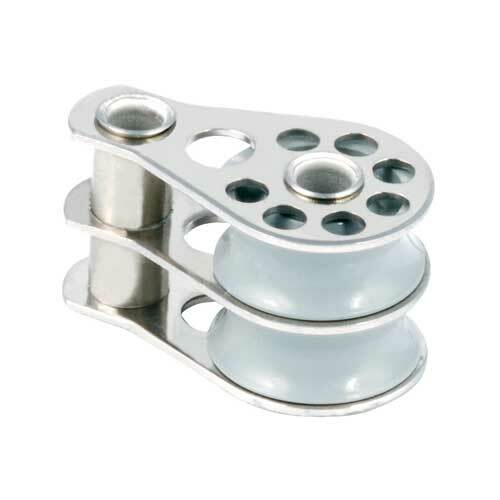 In this case a the small deck clip is slightly offset to starboard so the uphaul comes up centrally and then runs down the starboard side of the mast. You can finish it with a cleat on the mast. 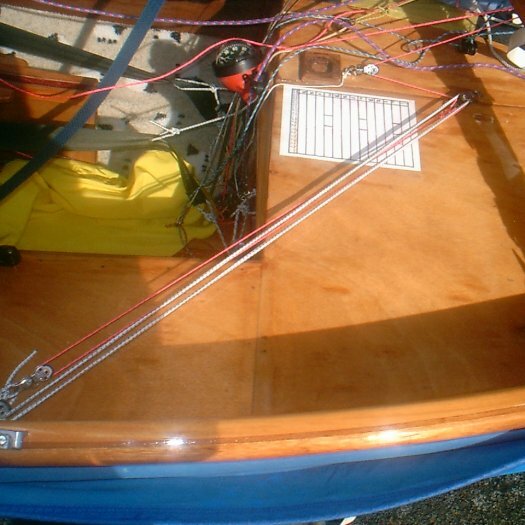 Alternatively you can run it around a turning block on the stowage bulkhead and then back to a cleat on the side of the daggerboard case. 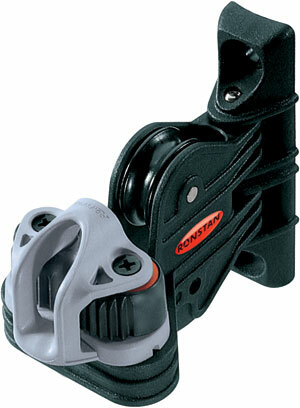 In this case a Ronstan RF5001 cleat and RF5005 fairlead. To run it aft in this manner you need about 7.5 metres of line. If you have the cleat on the mast you will need about 6.5 metres. Because of the location of the reaching hooks, the uphaul is under considerable tension when on a reach. 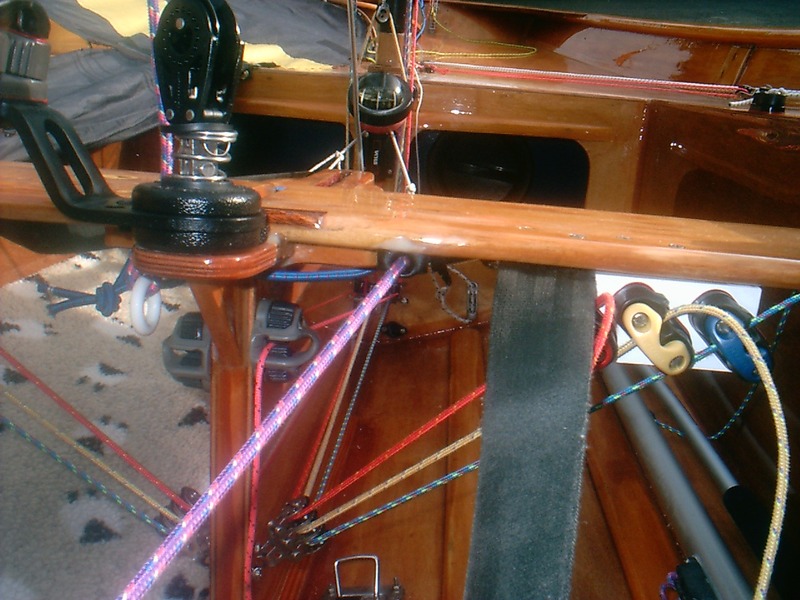 I recommend you use a high performance line that will not stretch such as dyneema/spectra or vectran. Do not have any elastic anywhere in the uphaul. It's important that the spinnaker pole eye is positioned so it does not interfere with the tack lacing of the mainsail around the mast. The tack will be well above the boom in a light wind but close to the boom when it is windy. So the pole eye needs to be above this range of positions. 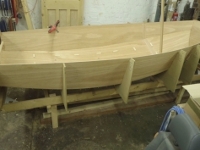 On my boat it is 970mm above the bottom of the tenon at the heel of the mast, that's about 330mm above the gooseneck. I recommend a spinnaker pole eye with three fixing points such as the Allen Brothers A3442. 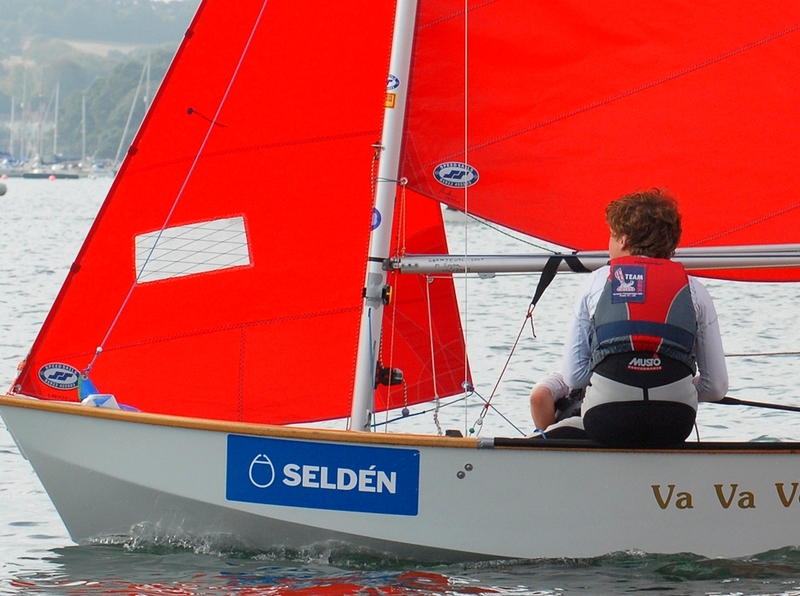 Note that class rules limit the projection of the eye forward of the mast to 35mm maximum. 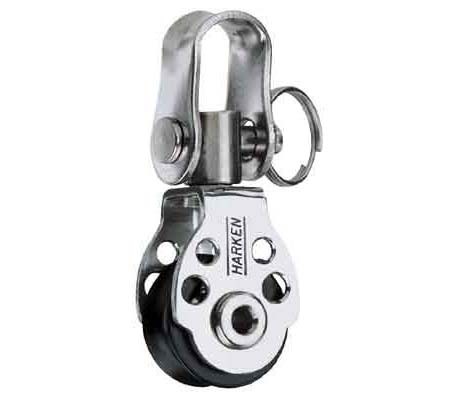 Stephen Heppell recommends a small Harken ball bearing block with a swivel, i.e. the HK417 illustrated earlier in the article. I use a Ronstan RF20100 which has a screw up shackle that avoids having a clevis pin ring here where it could snag the jib or spinnaker. The natural position of the block will be to slide back against the mast, this works OK and most boats are set up like this. 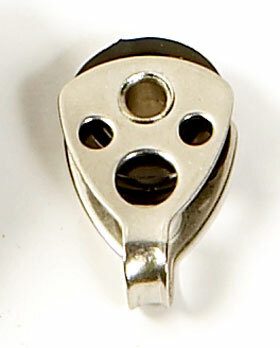 You can avoid this by having a small stainless steel bar welded inside the eye to keep the block at the front. 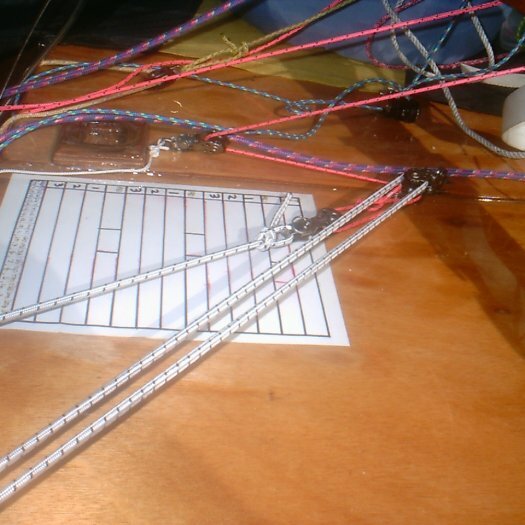 The modified eye pictured can still be used with an end to end pole system. 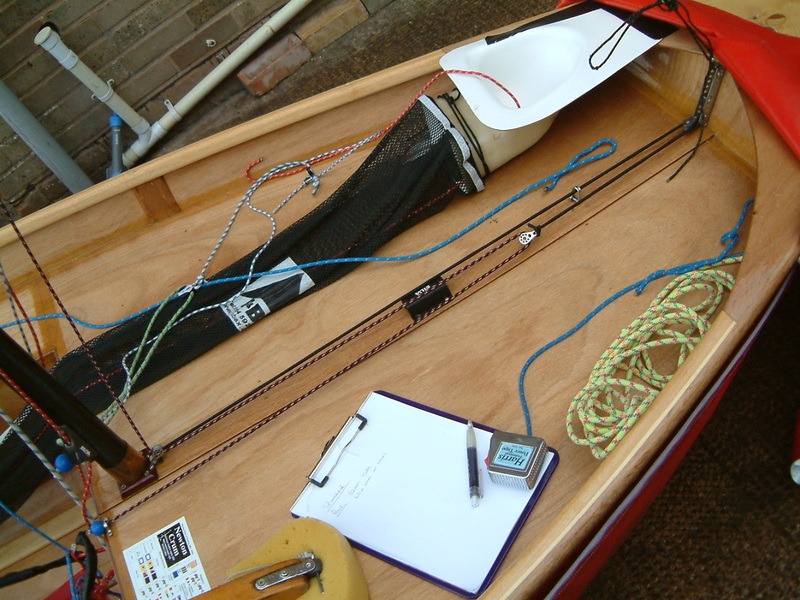 Stephen Heppell's article shows the cleat for the spinnaker pole depolyment line on the aft edge to the daggerboard case. An alternative position, which will allow the crew to trip the pole off the mast, is on the stowage bulkhead just above the driprail. It needs to be mounted on a block so it cleats automatically when the pole is pulled out. Mounting it on the driprail can work, but the line is under considerable tension when reaching in a strong wind. The pull on the cleat can cause the bulkhead to distort and the driprail to twist aft and upwards so the line comes out of the cleat. 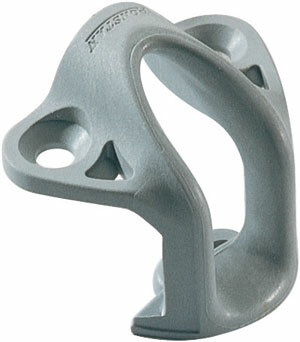 The most popular position for this cleat on boats with a crew is on the aft side of the mast. This is done using a swivelling cleat such as the Ronstan RF5. 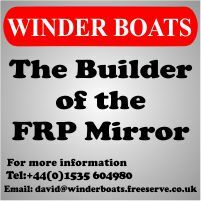 This arrangement allows the crew to pull the boom out (the helm can lean forward and help if necessary) so spreads the workload between helm and crew more evenly. 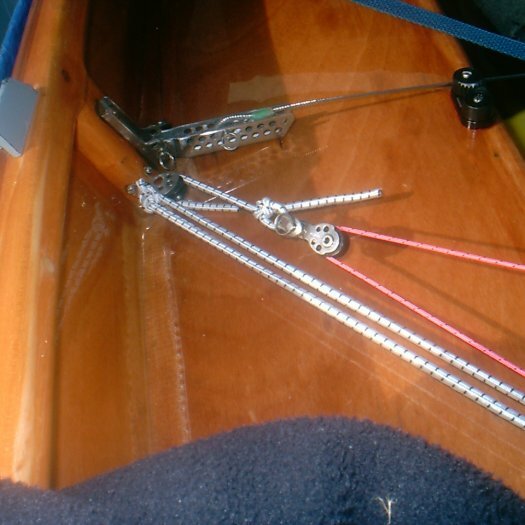 It's a good idea to run a piece of elastic from the fairlead on top of the cleat up to the boom where the kicking strap attaches to stop the jib sheets flicking around the cleat. 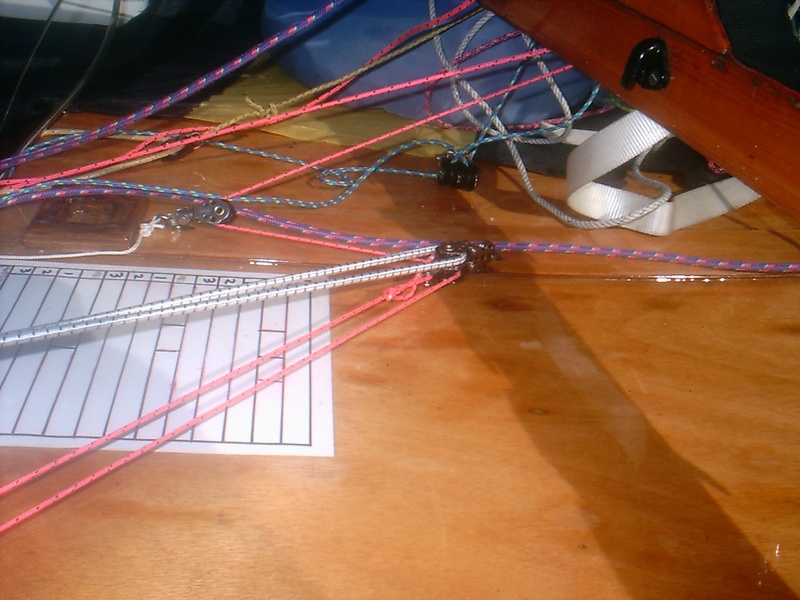 The key boom dimension is the position of the eye (or sheave block if you are rigging the spinnaker pole elastic inside the boom) which the elastic from the inboard end of the boom goes through. 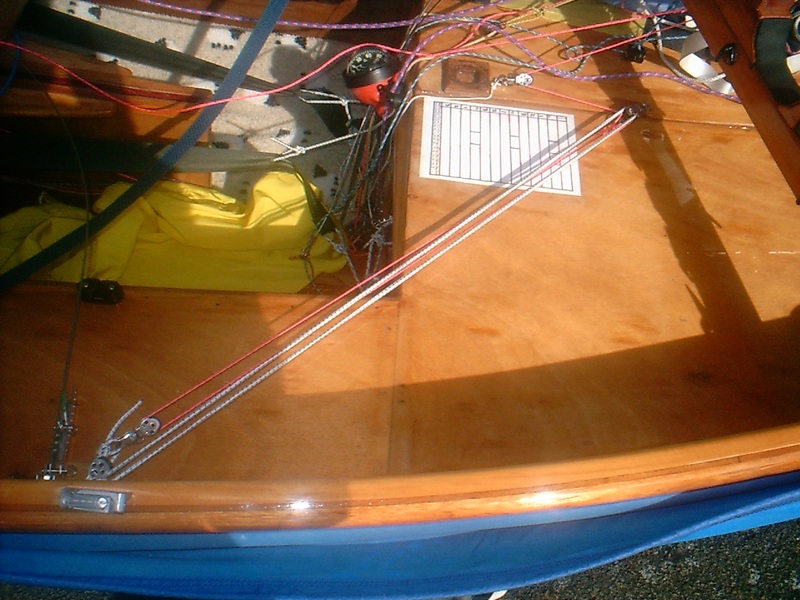 This needs to be positioned so that the outer end of the boom is resting against the mast when stowed. If the pole projects too much it will catch on the jib. If the eye is too far aft the pole may end up on the wrong side of the mast. On my boom the fitting is 1420mm from the inboard end of the boom spar (i.e. 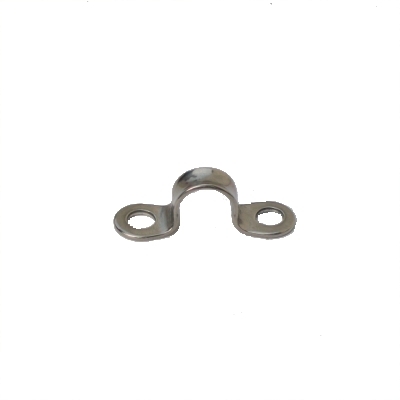 excluding gooseneck fitting). 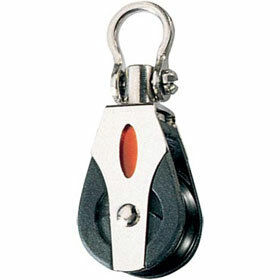 It's best to check this dimension with your own spinnaker pole and gooseneck fittings. The elastic to pull the pole back should be 5mm diameter and needs to be about 4m long.